As a lifetime fan of horse racing I try to get to as many meetings and open days as I can, though that's not nearly as many as I'd like to. This year we visited Lambourn for the first time in several years, principally to see my all-time favourite Kauto Star, and a few boxes down from him, the Hennessy winner Many Clouds. We took LOTS of photographs...and I mean lots! From every angle and vantage point. I've had a problem with my eyes now for a few years so sketching from life is pretty impossible. Give me an hour of the kind of concentration involved in such an exercise and my eyes are so blurred I can barely see straight! So photographs it is then. I had already decided to paint Many Clouds as he's such a handsome horse. Very dark with a lovely pale muzzle. I had also decided to put a pound or two on him in the Grand National the following week after a word in his ear..ha ha! 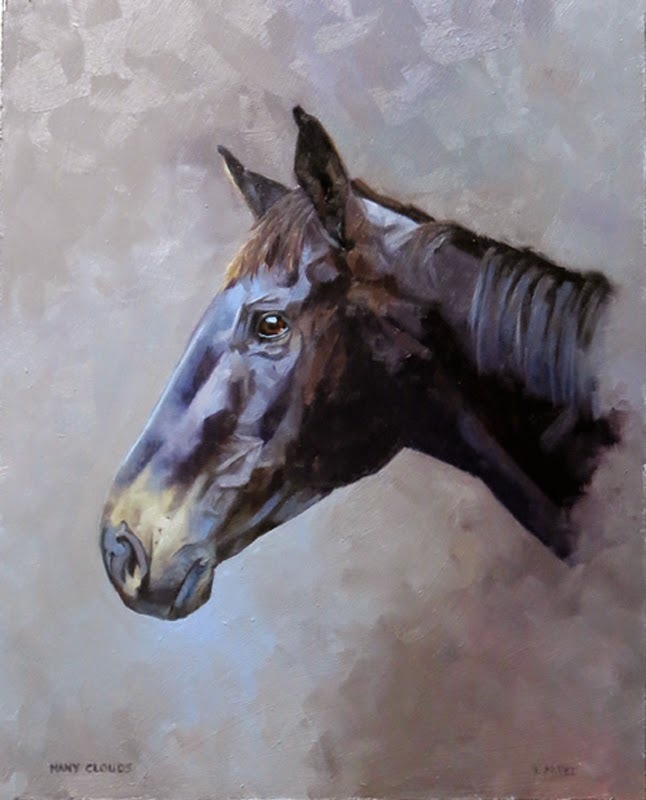 I do plan to paint a larger portrait of the (now) Grand National winner, but in the meantime I decided to do a little 10 x 8 study, just to feel my way. So here he is. A subdued palette for this very dark brown horse: vandyke brown, cobalt violet, winsor violet, ultramarine blue, naples yellow, king's blue deep, alizarin crimson, raw sienna, ivory black and titanium white. I think that covers it! Member of the Society of Equestrian Artists. Winner of Best in Show 2014, The Horse in Art.